Peter Hans van den Muijzenberg currently resides in the City of Sneek (Snits), in the Province of Friesland (Provinsje Fryslân / Provincie Fryslân), The Netherlands (Nederland). Besides editing a few pages, Peter Hans contributes to FOTW by writing and running perl scripts. Because of the need for well-formed input to the scripts, and also because of his own tendency to roam all over the site, he'll often encounter, and help correct, small errors that crept into the site over the years. A limit to his rather wide interest in most things vexillological, is the time-constraint caused by a part-time job as assistant at a high-school in Sneek. He primarily assists in a computer lab, but application of computers to tasks at hand is not just a job for him, but also shows in most of his other pursuits, including in his interest in vexillology. Peter Hans' concern for proper colors and ratios in flag design is well known. 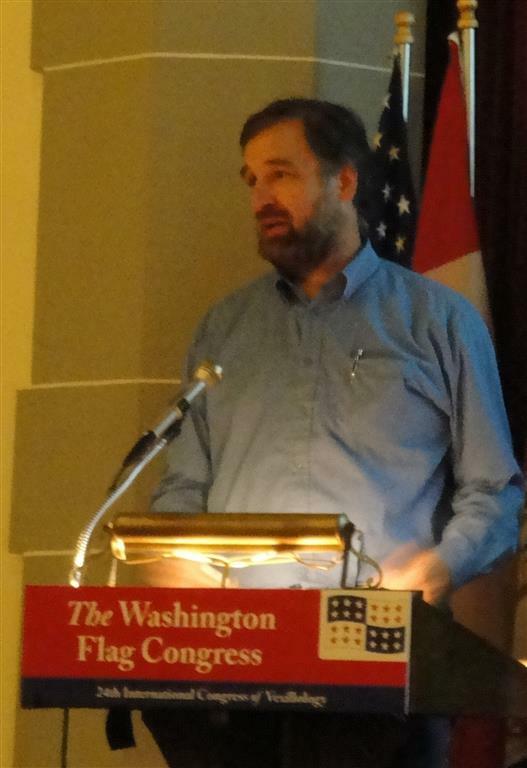 That his presentation at the Washington Flag Conference - on using predetermined criteria to judge the quality of a flag design - had a computer-supported basis also came as no surprise to anybody who knows him. When not at school and not involved in vexillological pursuits, Peter Hans keeps busy singing, dancing, and cycling across northwestern Europe, and occasionally elsewhere. When the ship with time comes in, he would also be interested in taking up some hobbies. As a graphic artist Peter Hans has contributed well over 300 flag illustrations and images to the pages of FOTW. While it is true that Peter Hans, before taking up his current editing tasks, had not edited long-term for quite a while, in days long past he started out his editing career with the topic of Olympic Games. Indeed, for good or for bad, he's the cause of there being a whole domain on that subject. In the time since, he has had the tendency to get involved with short-time projects, especially such as improve the over-all quality of the site. His handiwork can thus be found all through the FOTW website. on the more complex designs. Nominated for Vexillologist of the Year in 2012 and 2015. Named Vexillologist of the Year in 2016.